Birdie Tebbetts was from 1936 to 1952 a platoon catcher for the Tigers, Red Sox and Indians. In his time, he played with Hank Greenberg, Mickey Cochrane & Ted Williams. Though he batted over .300 just once (BOS 1950), Birdie was a 4x All Star — 1941, ‘42, ‘48 & ‘49. After his playing days ended he managed in the minors and later at the highest level with the Redlegs, Indians and Braves. He never reached the post season but he was named 1956 Manager of The Year in the National League. It wasn’t his batting that made him an All Star. The Vermont native was an excellent defensive catcher. He twice led the AL in throwing out base stealers. It wasn’t his playing skills that earned him a coaching and scouting career that lasted until he was 79 years old. This 196 page hardcover book was published 3 years after his death at age 87. It is written entirely in his voice, as if co-author James Morrison worked straight from a series of tape recordings. He tells a great one about how Ted Williams was second guessing his ability to call a game when they were Boston teammates. Cleveland’s Lou Boudreau had hit Boston pitching pretty hard with Birdie behind the plate so Ted suggested incompetence relentlessly. To his credit, Tebbetts didn’t argue. He told Ted, “OK, let’s see how you do.”. And he told Ted how to signal the pitches to him from his position in left field the next time Boudreau batted. Sure enough, the next time the Indian player-manager stepped into the box, Ted signaled the pitches to Birdie, Birdie signaled them to the pitcher, and Ted was calling the game. Whack ! A Double ! Next time Boudreau was up Ted called them again. Whack ! Another Double. That shut up Mr. Williams. Tebbetts arrived in the majors a bit ahead of schedule due to a horrific beaning of Mickey Cochrane. On May 25, 1937, Irving Darius Hadley threw to Gordon M. Cochrane an inside fastball that came out of the white shirts in the Yankee Stadium bleachers, striking Cochrane on the skull and fracturing his cranium. The incident was the beginning of the end for Cochrane’s playing days. It gave rise to Hadley’s nickname: Bump. It caused the gradual establishment of dark batting backgrounds in the major leagues. And it propelled Birdie Tebbetts from minor leagues into the Tigers catching platoon, a role he shared with Rudy York, a slow footed, ham-handed Indian that could not catch a lick but could surely bang 35 home runs a year. The Big Indian liked to hit & he liked to drink. He wasn’t the only character around. The authors paint a picture of the radio era, when the Depression was on and America needed heroes like DiMaggio, Feller, Gehrig, Williams, Boudreau, plus a few square pegs like York. It was a simpler and more straight-forward time populated with poverty-hardened characters. When Ben Chapman left the Yankees for the Senators in 1936, Gehrig told Tebbetts to punch the Nats new outfielder if he got the chance. If Tebbets would punch Chapman twice, Lou would buy Birdie two suits. 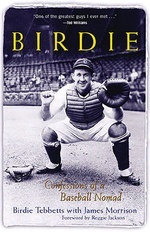 Birdie lost three years to military service during World War II. He was approached during the 1942 season to volunteer, and put together a morale team consisting entirely of major league players. Tex Hughson, Joe Gordon, Sid Hudson, Max West, Enos Slaughter, Ferris Fain and Howie Pollet were all on Lieutenant Tebbets’ team. At first, they played all around Texas but were later deployed to the South Pacific. They flew secretly to Iwo Jima the day after the Marines raised the flag. Before 12,000 dirty, bloody, hardened Marines, they played a game of baseball to create normalcy within the context of insanity. Birdie Tebbets called it the most important game he ever played. I chuckled when I read that, realizing that the baseball cards of these two guys (for the most part) fill the common boxes and bargain bins at sports collectible shows. Further, not only are they largely unknown and unrecalled, but Mossi’s baseball cards revealed that his ears were bigger than any other mammal known to humanity. So, I looked it up. Mossi & Narleski pitched for the Indians from 1954 to 1958. Ears was named an All Star in 1957. Mossi was an All Star in 1956 & 1958. Interestingly BOTH received MVP votes in 1955. Could their MVP ballot worthy year indicate their best combined contribution ? In 1955, Mossi appeared in 57 games and Narleski in 60, their respective ERA’s being 2.42 and 3.71. Narleski led the major leagues with 19 saves in ’55, and Mossi had the 5th most in the A.L. that year with 9. No other two bullpen team mates had as many combined saves in either league. Their combined won-lost record was 13 – 4. Pretty damn good. And, it was pretty damn good team they played for. Their team mates were Hegan, Wertz, Rosen, Kiner, Doby. A rookie named Rocky Colavito would make a late debut, too. Plus Wynn, Score, Lemon, Garcia & Feller. The 1955 Indians finished 93 – 61 in 2nd place, 3 games behind the Yankees, winning 13 of 22 vs. New York. Old Birdie was onto something. If you love Ted, or if you love head games, you’ll love this one. No longer teammates, Ted & Birdie squared off in regular play beginning in 1951. Now an Indian, Birdie had just as much trouble getting Ted out as anyone. He decided to “break the code”. Birdie would break Ted’s focus on the cat-and-mouse guessing game of what pitch was coming by simply telling Ted what was on the way. “It’s a curveball Ted.” And, “It’s a fastball, Ted.” When Ted took those pitches and they were exactly what Tebbets said they would be, Ted became enraged and stayed mentally out-of-whack for the next 2 days. The distraction worked. He couldn’t buy a hit. This book is a great & fast read. Birdie passed 12 years ago but this little book conveys his good will and energy. I think you’ll like it.